RAIN… the forecast is for heavy rain on Saturday starting around midday. We plan to go ahead with the class unless the rain starts earlier than expected. HOWEVER - we won’t be doing any actual pruning this Saturday, because the rain will make the trees more susceptible to bacterial infections. We will learn about pruning this week, and then make a plan to come back and get some practical experience later in the month, either January 19th or 26th (subject to weather conditions). 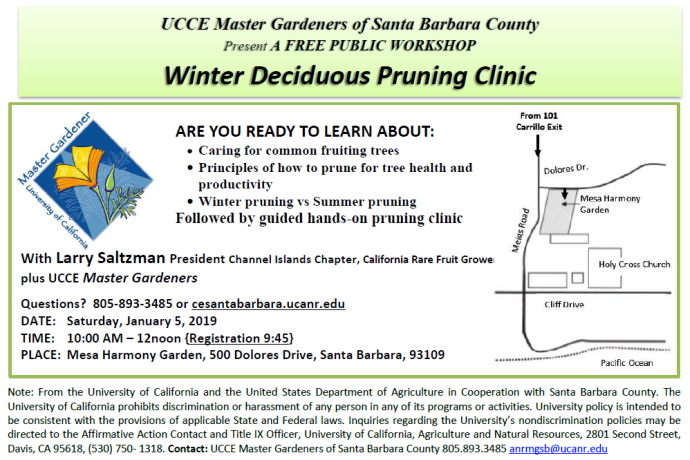 There’s always something new to learn about pruning, so please do join us.